At the installation meeting of Birchwood Lodge No 8861 a donation of £275 was allocated to St Rocco’s Hospice and John Geering, a past master of the lodge was delighted to present the cheque to Tracy Barnes, a representative and fund raiser of the Hospice. Tracy Barnes (left) and John Geering. This is the latest cheque to be presented by the lodge and over recent months the lodge has donated a grand total of £2,000. 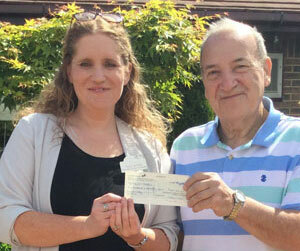 Tracy thanked John for the donation and for the continued support from the Freemasons in the Warrington Group.